Nurses in Elgeyo-Marakwet County protest outside Governor Alex Tolgos’ office in Iten on February 05, 2019. Nairobi County nurses have suspended their strike for two days after striking a deal with the county government on Tuesday. In the return-to-work deal, Governor Mike Sonko has committed to paying uniform allowance and nursing services allowance. Sonko agreed to include the allowances within two days in the salaries to paid for the month of January. 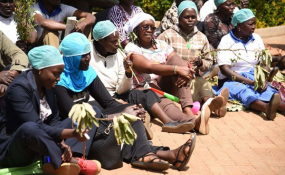 "We have agreed together with the nurses to form a committee that will follow up on the issues we have agreed on to ensure they are delivered within the two days," said Sonko after a five-hour long meeting with the nurses at City Hall. Acting Nairobi County Health Executive Mr Charles Kerich, who led county officials in penning the deal with Kenya National Union of Nurses (Knun) Nairobi branch officials, said that the county had already factored in the nurses demands in their 2018/2019 financial year budget and that it was only implementation that was pending. "Some of the concerns they are raising are not strange because we have already budgeted for them, what is remaining is only the implementation," said Mr Kerich. Knun Nairobi branch secretary Ediah Muruli warned that they will resume their strike if the funds will not have been released after the agreed 48 hours.